Talks on a range of contentious issues involving the North’s main political parties collapsed for a second time within a week on New Year’s Eve, with mediators Richard Haass and his colleague, Meghan O’Sullivan, again returning swiftly to the US. Recriminations among the political parties were virtually non-existent, however, and a new effort to conclude a process described as “80 to 90 percent complete” is expected to get underway shortly. Local elections due to be held in May present a looming obstacle to any new round of negotiations, however. It is thought an endorsement of agreed elements would need to be concluded within weeks before electoral concerns overwhelm the political agenda. 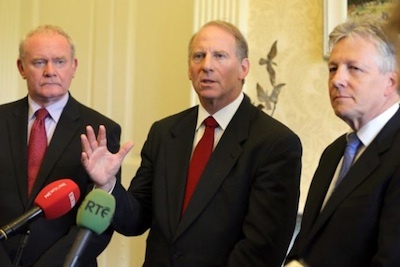 Despite his dramatic departure after a marathon talks session failed to produce a deal, Mr Haass said he would “not be turning his back” on the process, and left open the possibility that he could return to Belfast for a final round of talks. At his urging, the parties agreed to publish the current draft of proposals, and a multi-party ‘working group’ to continue the process is now under discussion. The document, in its latest form, includes suggestions for several agencies and commissions to be created to take on the task of dealing with some of the most contentious issues facing the Six Counties -- flags, symbols, sectarian parades and dealing with the past conflict. The seventh draft of the proposals were said to have been sharply reduced in ambition in order to win the support of unionists, but that was still not enough to win over the DUP, which has maintained a hard line on several issues, particularly the issue of flags. A key sticking point has been loyalist demands for a permanent return of the British Union Jack to the flag-post at Belfast City Hall. That issue sparked months of violence and disturbances by the unionist paramilitary UVF, among others, and no agreement of any substance was reached on that issue. Another sticking point in the final round of talks was a code of conduct for those taking part in parades, such as a ban on paramilitary uniforms and emblems. An unconfirmed report claimed that the idea was ruled out by unionists after receiving strong opposition from the UVF. But DUP leader Peter Robinson said on Wednesday that the momentum from the recent talks session should not be lost, and he significantly d!supported Haass’s suggestion that a cross-party working group should be created. Sinn Fein’s Gerry Adams said there was still an opportunity to resolve outstanding issues, and said his party’s leadership would recommend that its executive endorses the document when it meets on 11 January. He said others “should not fudge their response”, and urged the Dublin and London governments and the other parties to “grasp the opportunity that now exists to resolve outstanding issues”. “Sinn Fein would like to have seen some aspects of the proposed agreement strengthened and improved further,” he said. “More work is required on parity of esteem, equality and respect for all cultures and identities. However agreement on everything was not possible. Outside political circles, however, the public response to the talks has been muted. The strongest reaction came from journalists covering the talks -- some expressing bitterness at another uneventful late-night talks climax, while others openly questioned the sincerity of the process and its participants. Feeding into public cynicism is that the talks are undoubtedly being used by the North’s main parties, at least in part, to jockey for position ahead of the first electoral test in the Six Counties for years. Republican socialist party eirigi dismissed the entire process as “a Christmas pantomime”. Members of nationalist resident groups, victims’ organisations and ex-prisoner groups have also expressed concerns over the real-world viability of the proposals. Sean Hanna, chairman of the Rasharkin Residents Collective, believes the process was doomed to failure: “If you want to resolve parades and contentious issues you have to go to the people who represent locals and they had no consideration for us at all. * The police Historical Enquiries Team to be replaced by a ‘Historical Investigations Unit’, to take over all future police investigations dealing with the conflict (prior to the signing of the 1998 Good Friday Agreement). * The creation of an ‘Independent Commission for Information Retrieval’ (ICIR) to allow victims to access information about how their loved ones were killed. Those who give evidence to this commission would have ‘limited immunity’ from prosecution, in that the commission would not share its information with the Historical Investigations Unit. * The creation of a ‘Conflict Archive’ for all those “who wish to share their experiences connected with the conflict”. * The creation of an ‘Office for Parades, Select Commemorations, and Related Protests’ (OPSCRP) to “facilitate the vast majority of parades and other events that are non-contentious”, and a code of conduct for such events. It would be controlled by the Office of First Minister and Deputy First Minister. * The creation of an ‘Authority for Public Events Adjudication’ (APEA) with seven members, including a chairman or chairwoman, to decide on contentious parades. It would replace the Parades Commission and have the power to ban parades. Its decisions could be appealed by judicial review. * The creation of a ‘Commission on Identity, Culture, and Tradition’ (CICT) not later than three months after the signing of the proposed agreement. It would write a report by 2015 and issue its recommendations, which would be expected to include some relating to flags and symbols. * The creation of an ‘Implementation and Reconciliation Group’ (IRG) to oversee all the new bodies established by the agreement. It would also have a role in putting together a “factual chronology of the conflict”.